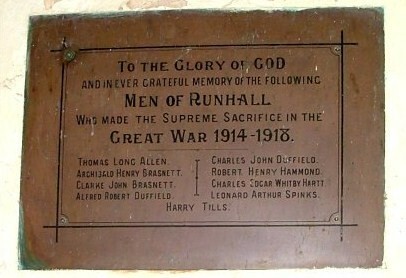 The Runhall memorial is to be found within the parish church of All Saints. The memroial takes the form of a bronze plaque inscribed with black lettering inset into the interior wall of the church. There are nine men listed on the plaque. Private 26236, 7th Battalion, Royal Fusiliers (City of London Regiment). Died in United Kingdom 27 September 1917. Aged 35. Born Runhall, enlisted Norwich, resident Hardingham. Husband of Elsie May Allen, of Plough Lane, Hardingham. 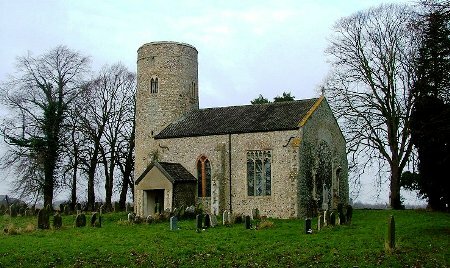 Buried in ALL SAINTS CHURCHYARD, RUNHALL, Norfolk. Petty Officer Stoker K/5384, H.M.S. Mallow, Royal Navy. Died 22 February 1919. Aged 29. Son of the late Mr. and Mrs. F. G. Brasnett, of Runhall, Attleborough, Norfolk. No known grave. Commemorated on PORTSMOUTH NAVAL MEMORIAL, Hampshire. Panel 32. Private G/15237, 11th Battalion, Royal Sussex Regiment. Killed in action 4 November 1915. Aged 31. Born Hindringham, enlisted Wymondham. Son of Robert and Charlotte Duffield, of Kimberly, Wymondham. Buried in BOULOGNE EASTERN CEMETERY, Pas de Calais, France. Plot VIII. Row D. Grave 163. Private 66606, 51st Battalion, Machine Gun Corps (Infantry). Killed in action 24 July 1918. Born Hindringham, enlisted Norwich, resident Hardingham. Formerly 26245, Norfolk Regiment. Buried in ST. IMOGES CHURCHYARD, Marne, France. Plot/Row/Section B. Grave 13. Lance Corporal 23071, 7th Battalion, Border Regiment. Killed in action 7 August 1916. Aged 36. Born and resident Runhall, enlisted Norwich. Son of Mrs. Matilda Hammond, of Little Ellingham, Norfolk; husband of Laura Amelia Hammond, of 69, Low St., Hardingham, Norwich. Formerly 17869, Norfolk Regiment. No known grave. Commemorated on THIEPVAL MEMORIAL, Pas de Calais, France. e: Pier and Face 6 A and 7 C.
Private G/5552, 2nd Battalion, Royal Sussex Regiment. Killed in action 26 February 1916. Aged 17. Born Carbrook, enlisted Norwich. Son of James and Emma Hartt, of Mount Pleasant, Barnham Broom, Norwich. No known grave. Commemorated on ARRAS MEMORIAL, Pas de Calais, France. Bay 6. Stoker 1st Class K/5939, H.M.S. Staunch, Royal Navy. Lost with his ship when it was torpedoed 11 November 1917. Aged 25. Son of Mrs. A. E. Spinks, of Runhall, Attleborough, Norfolk. No known grave. Commemorated on PORTSMOUTH NAVAL MEMORIAL, Hampshire. Panel 26. Note: HMS Staunch was an Acorn Class Destroyer, built by William Denny & Brothers, Dumbarton, launched 29 October 1910 and torpedoed and sunk by U-boat UC.38 off Gaza, Palestine, 11 November 1917. Lance Corporal 10809, 5th Battalion, Oxfordshire and Buckinghamshire Light Infantry. Killed in action 16 June 1915. Born hardingham, enlisted Oxford, resident Runhall. No known grave. Commemorated on YPRES (MENIN GATE) MEMORIAL, Ieper, West-Vlaanderen, Belgium. Panel 37 and 39.